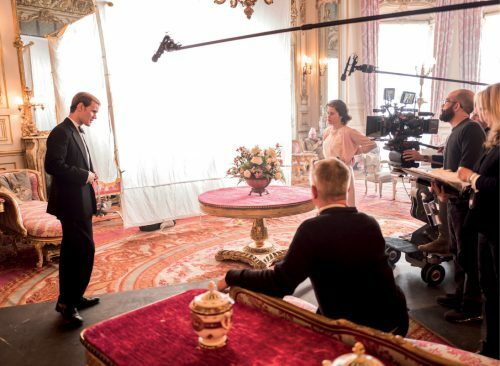 Molinare’s senior colourist Asa Shoul returned for series two of The Crown. He talks to Jenny Priestley about adding colour to the 1950s and 60s. FOR THOSE OF US THAT DON’T KNOW, WHAT EXACTLY DOES COLOUR GRADING INVOLVE? Colour grading is the process of altering the colour, brightness and contrast of an image or series of images to firstly match them together and then to create specific looks to enhance the storytelling. As well as basic controls we can change individual colours and areas of the image to focus the viewers eye on specific aspects of the frame. THE CROWN’S FIRST SERIES WAS SET IN THE 1950S – WHAT DID THAT MEAN FOR YOU IN TERMS OF COLOUR GRADING? We started trying out different looks during camera tests and indeed went for a muted palette but then when viewing some make-up and costume tests these didn’t feel appropriate for the series. Claire Foy looked ghostly and the lush interiors looked faded so we changed our approach. ALSO, THE CROWN IS SHOT IN 4K, WHAT DOES THAT MEAN FOR COLOUR GRADING? Apart from needing more storage and faster processors, the approach was the same but it was unforgiving in terms of hiding any wig-lines or reflections of production equipment. With 4k you see everything so there was more work to do to finesse the fine detail of skin. TO WHAT EXTENT DO YOU WORK WITH OTHER MEMBERS OF THE PRODUCTION TEAM? I worked closely with the cinematographer Adriano Goldman and through him the make-up and costume departments. With the early grade tests I supplied jpegs to production to show the effect the grade was having on the lipstick and certain key costumes so that they could alter colours before filming, which saved us a lot of time in the final grade. It’s always better to have them change lipstick colour on set rather than us having to isolate and track someone’s lips for hundreds of shots. We also worked with the digital imaging technician to ensure the look of the dailies rushes that editorial work with was close to our desired look. DO YOU WORK WITH THE VFX TEAM? We worked closely with One of Us, sending them graded references for various scenes to ensure their visual effects wouldn’t need too much adjustment in the grade. HOW EARLY DID YOU GET INVOLVED IN BOTH SERIES ONE AND SERIES TWO? We started testing about three months before series one and ten on series two. We did some exposure tests with the Sony F55 to check for noise in the blacks at various ISO ratings and also with some fog filters as production wanted to have the feeling of subtle smoke in some locations where they couldn’t add it practically. I KNOW YOU DID A LOT OF RESEARCH FOR SERIES ONE, DID YOU DO THE SAME FOR SERIES TWO? For series two I looked at some of the fashions of the day and also images from Egypt, Australia and the Antarctic. YOU’VE ALSO WORKED ON SERIES TWO – WERE THERE ANY DIFFERENCES TO SERIES ONE? We tried to be subtle and most of the changes were done through costume and location but we always tried to change things slightly even when returning to a location so that it stayed fresh for the viewer. WHY IS BASELIGHT SO IMPORTANT TO YOUR WORK? I helped to develop Baselight whilst at Framestore CFC where it was invented and the team at FilmLight are incredibly responsive to requests for new features and ways of working. Baselight is designed so that everything is at your finger-tips so that you spend your time looking at the image rather than down at a keyboard or going through menus so the grading experience feels creative and fluid. It’s also a powerful compositing tool so we achieved a high number of clean-ups and some vfx whilst in the grade. WHAT’S THE BIGGEST CHALLENGE OF WORKING ON THE CROWN? Although we want all the episodes to feel that they have a consistent look we also want to keep it interesting and diverse, coupled with the fact that we’re working with two cinematographers and four directors who wish to make their episodes distinctive makes for a challenging but rewarding grade. WHAT’S YOUR FAVOURITE CROWN SEQUENCE THAT YOU WORKED ON? This season there’s an episode where we cut back and forth across 30 years to the same location with Charles and his father Philip when he was a boy at school. We wanted to find a way to take the viewer instantly to each time-frame without the need for onscreen graphics telling us when and where we were. This was a great challenge and I thoroughly enjoyed it.